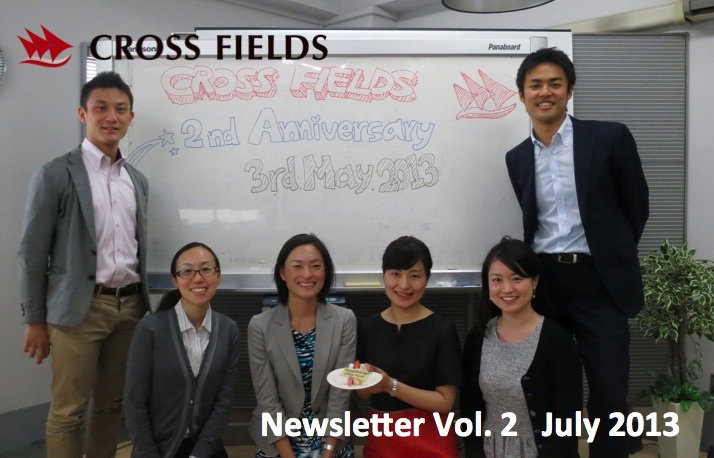 On May 3rd, we celebrated the second anniversary of CROSS FIELDS’ foundation! In our two-year journey, we sent 10 Corporate Volunteers from Japan to 5 Asian countries. We would not have made it possible without great support of our partners and friends and we would like to take this opportunity to express to you our sincere appreciation for your kind support and cooperation. We are strongly committed to continue our endeavor to realize many more collaborations between local organizations in Asia and Japanese corporations! 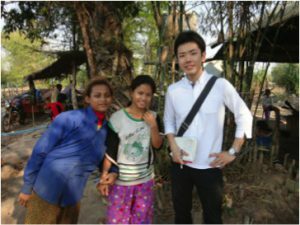 In this volume of our Newsletter, we would like to share with you stories of 4 International Cooperate Volunteering projects between February and April 2013; 1 with Panasonic Corporation, 1 with Hitachi High-Technologies Corporation and 2 with Hitachi, Ltd. Hope you feel the excitement that the Corporate Volunteers and the host organizations had! 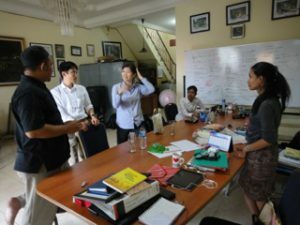 Two engineers from Panasonic Corporation worked as Corporate Volunteers for 3 weeks in March 2013 at a NGO in Indonesia, which empowers marginalized people through introducing sustainable energy. One engineer, aged 36, is specialized in mechanical engineering, and the other, aged 33, in software development. A support team based in Japan consisting of members with different backgrounds such as R&D, design and marketing, helped the two volunteers remotely. 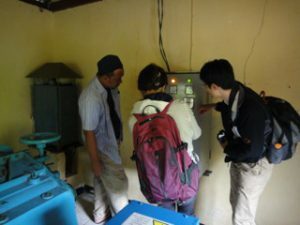 In some villages with Off-Grid Micro-hydro plants implemented by this NGO, the energy consumption level were lower during daytime because people went to work in farms. The NGO were looking for ideas to utilize the excess of the energy in Off-Grid areas in order to increase income of the villagers. The NGO staff said, “It was impressive that the volunteers were extremely hardworking. They came up with interesting proposals. Especially the idea to measure the excess of electricity is fascinating because its cost is more reasonable and its technology is simpler than any other ideas that we had before.” The volunteers also presented ideas and formats for effective research and analysis, as well as, suggested some ideas to utilize the excess of energy. 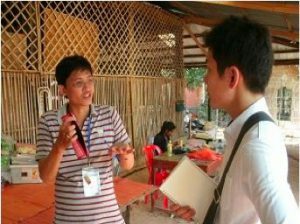 For 4 weeks from February 2013, a young employee of Hitachi High-Technologies Corporation was dispatched as a Corporate Volunteer to a NGO in Cambodia that works to prevent child trafficking and provides rural women with skills to make handicrafts for their job opportunities. The mission of the 28 year-old volunteer who has sufficient knowledge of procurement was to improve the NGO’s procurement methods and stock management. For, although the NGO had been willing to introduce more efficient ways of procurement and stock management, they did not have staff with such expertise and their efforts had made little progress. First, the volunteer interviewed closely with the persons in charge of procurement and stock management and examined the situation by visiting the factory every day. Then, he proposed 1) to establish a system to conduct procurement in a well-planned manner and 2) to introduce a new shelf for a better stock management, and together with the NGO staff members, he implemented the ideas. As a result, a progressive improvement was made and the local staff obtained better understanding of procurement and stock management. The NGO is planning to conduct a next procurement with the new method. 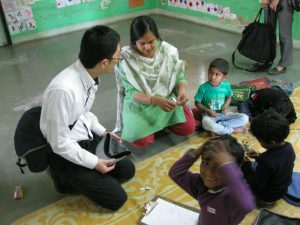 Hitachi, Ltd. sent a 33-year-old engineer specializing in server circuit design to a NGO based in Jaipur, India for 6 weeks from March 2013. The NGO runs community schools for children from low-income families in the slums and rural areas. As a part of the organization’s continuous efforts to raise education standards of the seven schools they run, they collected various data from each school. However, they had not been able to make an effective use of such data, as they had not established methods to analyze and manage them. To solve such situation, the volunteer designed and proposed a MIS that is easy to understand and manageable for all the concerned people by conducting hearings with teachers and those who administrate schools, sorting out type of data to be handled and data items to be analyzed, and finally organizing a workflow from data collection to data analysis. With this MIS, it has become easier for the NGO to detect problems of each school, which was difficult to grasp before. Also, using the MIS, they can smoothly examine the effect of their countermeasures. Apart from this mission, the volunteer also actively contributed to school activities by holding IT literacy class and ORIGAMI lesson, which is a Japanese traditional art, for children. 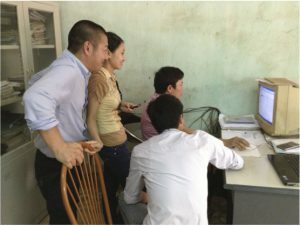 A software engineer from Hitachi, Ltd. aged 32, worked for 6 weeks from February 2013 as a Corporate Volunteer at a social enterprise in Vietnam. 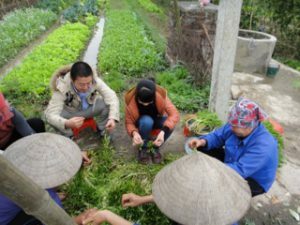 The enterprise supports farmers in remote areas to grow organic tea and spices by providing them with knowledge of organic farming, building cooperatives and running factories, and constructing supply-chain for export and domestic sales. Its department offices and factories are located throughout Vietnam, which makes it difficult for its management to know what is happening in those offices and factories. The management had been considering that something should be done to share important information effectively. Facing the enterprise’s such need, the volunteer closely studied the current situation and proposed some ideas for effective information sharing utilizing his IT knowledge. For example, he introduced how to utilize shared folders within the enterprise. He also examined how the accounting data was recorded and created rules for daily operation so that the data can be recorded effectively. Furthermore, he provided advices on criteria of choosing the future Enterprise Resource Planning (ERP) which the enterprise highly appreciated. Copyright © 2019 CROSS FIELDS All Rights Reserved.